Alonzo Weems has been included in Savoy magazine’s annual listing of the most influential black lawyers in the United States. The listing showcases African-American men and women who have been recognized for their legal leadership and expertise in national and global corporations. As Vice President and Deputy General Counsel of Eli Lilly and Co., Alonzo oversees Lilly’s corporate legal function – litigation, human resources, commercial transactions, regulatory and privacy – and serves as General Counsel for the company’s global biomedicines business unit. 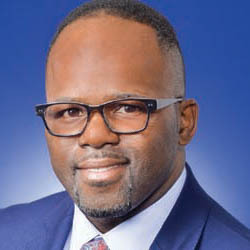 Following his 1992 graduation from Wabash, Alonzo received his J.D. from Indiana University Maurer School of Law. He joined Lilly in 1997.